To succeed in school, students need to be engaged, interested, and excited to be there. They need to know how to focus their attention on their work, keep trying even when they get discouraged or face setbacks, work effectively with other students and adults, and be good communicators and problem-solvers. These skills form a foundation for young people’s success not just in school, but in their adult lives. Social and Emotional Learning is a process for helping children (and adults) develop the fundamental skills for life effectiveness. SEL teaches the skills we all need to handle ourselves, our relationships, and our work, effectively and ethically. These are the skills that allow children to calm themselves when angry, make friends, resolve conflicts respectfully, and make ethical and safe choices. They are able to regulate their emotions. They are able to manage stress, control impulses, and persevere in overcoming obstacles. They have good relationship skills. They can establish and maintain healthy and rewarding relationships based on cooperation. They can resist inappropriate social pressure; constructively prevent, manage, and resolve interpersonal conflict; and seek and provide help when needed. The research is clear: attending to the social and emotional learning of children is a hugely profitable investment in their success in school and their future success as adults. Recent research clearly shows that students who receive SEL programming academically outperform their peers, compared to those who do not receive SEL. This includes greater motivation to learn and commitment to school, increased time devoted to schoolwork and mastery of subject matter, improved attendance and graduation rates, and improved grades and test scores. One major multi-year study found that by the time students who received SEL in grades K-8 were adults, they had an 11 percent higher grade-point average, significantly greater levels of school commitment, and a higher attachment to school at age 18. Effective SEL programming drives not only academic learning, but also important social outcomes such as positive peer relationships, caring and empathy, social engagement, and health-related behaviors. Research has shown that in addition to SEL programs producing positive effects in students, they also prevent negative outcomes. 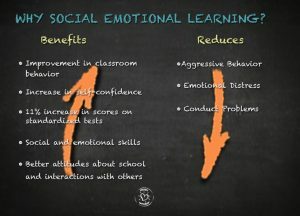 Learning social and emotional skills leads to reductions in problem behavior such as drug use, violence, and delinquency. The retention rate of students who received SEL in grades 1-6 was 14 percent, versus 23 percent of students not in SEL programs. The same students at age 18 showed a 30 percent lower incidence of school behavior problems, a 20 percent lower rate of violent delinquency, and a 40 percent lower rate of heavy alcohol use than their peers. 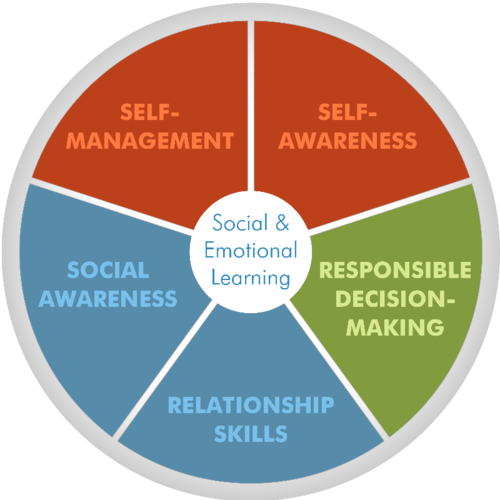 What Is The Outcome Of Social Emotional Learning? The short-term goals of SEL programs are to: one, promote students’ self-awareness, self- management, social-awareness, relationship, and responsible decision-making skills; and two, improve student attitudes and beliefs about self, others, and school. These, in turn, provide a foundation for better adjustment and academic performance as reflected in more positive social behaviors and peer relationships, fewer conduct problems, less emotional distress, and improved grades and test scores. There is a growing awareness in the U.S. among educators and policymakers about the importance of social and emotional development for successful student performance in preschool and elementary school. The five sets of SEL competencies are important from very early in life but are especially relevant as children begin to spend time with adults outside the home and to socialize with peers. Social and emotional skills play a role in determining how well-equipped children will be to meet the demands of the classroom. They also help determine whether students are able to engage fully in learning and benefit from instruction.